Wherever there’s water, there’s bound to be bubbles floating at the surface. From standing puddles, lakes, and streams, to swimming pools, hot tubs, public fountains, and toilets, bubbles are ubiquitous, indoors and out. A new MIT study shows how bubbles contaminated with bacteria can act as tiny microbial grenades, bursting and launching microorganisms, including potential pathogens, out of the water and into the air. In the study, published today in the journal Physical Review Letters, the researchers found that bacteria can affect a bubble’s longevity: A bacteria-covered bubble floating at the water’s surface can last more than 10 times longer than an uncontaminated one can, persisting for minutes instead of seconds. During this time, the cap of the contaminated bubble thins. The thinner the bubble, the higher the number of droplets it can launch into the air when the bubble inevitably bursts. A single droplet, the researchers estimate, can carry up to thousands of microorganisms, and each bubble can emit hundreds of droplets. “We discovered bacteria can manipulate interfaces in a manner that can enhance their own water-to-air dispersal,” says Lydia Bourouiba, assistant professor of civil and environmental engineering and director of the Fluid Dynamics of Disease Transmission Laboratory. Bourouiba’s co-author on the paper is graduate student Stephane Poulain. Bourouiba has spent the past several years meticulously generating, imaging, and characterizing clean, uncontaminated bubbles, with the goal of establishing a baseline of normal bubble behavior. “We first had to understand the physics of clean bubbles before we could add organisms like bacteria to see what effect they have on the system,” Bourouiba says. As it happens, the researchers first noticed bacteria’s effect somewhat by accident. The team was in the midst of moving to a new lab space, and in the shuffle, a beaker of water had been left out in the open. When the researcher used it in subsequent experiments, the results were not what the team expected. “The bubbles produced from this water lived much longer and had a peculiar thinning evolution compared to that of typical clean water bubbles,” Poulain says. Bourouiba suspected the water had been contaminated, and the team soon confirmed her hypothesis. They analyzed the water and found evidence of bacteria that are naturally present indoors. To directly study bacteria’s effect on bubbles, the team set up an experiment in which they filled a column with a solution of water and various bacteria species, including E. coli. The researchers developed a system to generate bubbles with an air pump, one at a time, inside the column, in order to control the volume and size of each bubble. When a bubble rose to the surface, the team used high-speed imaging coupled with a range of optical techniques to capture its behavior, at the surface and as it burst. The researchers observed that, once a bubble contaminated with E. coli made it to the water’s surface, its own surface, or cap, immediately started to thin, mostly by draining back into the water, like a melting shell of chocolate. This behavior was similar to that of uncontaminated bubbles. But the contaminated bubbles remained on the surface more than 10 times longer than uncontaminated bubbles. And after a critical period of time, the bacteria-laden bubbles started thinning much faster. Bourouiba suspected that it might not be the bacteria themselves, but what they secrete, that holds the bubble in place for longer. The researchers washed bacteria away from their secretions, then repeated their experiments, using the bacteria’s secretions. Just as Bourouiba suspected, the bubbles containing the secretions alone lasted much longer than clean bubbles. The secretions, the group concluded, must be the key ingredient in extending a bubble’s lifetime. But how? 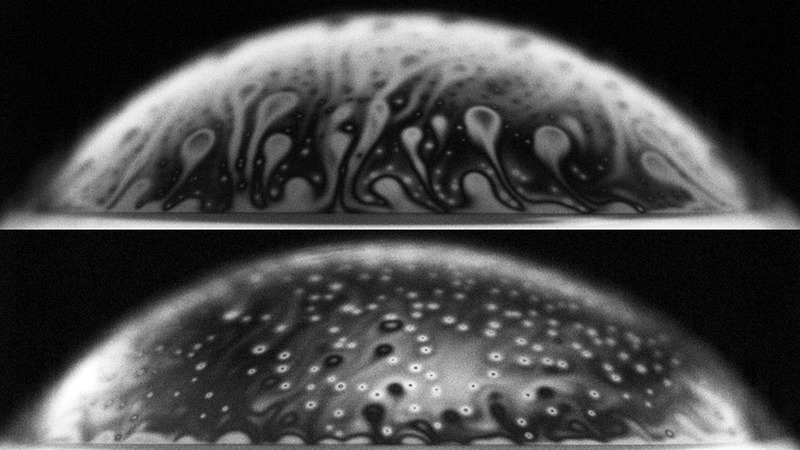 Again, Bourouiba had a hypothesis: Bacterial secretions may be acting to reduce a bubble’s surface tension, making it more elastic, more resistant to perturbations, and in the end, more likely to live longer on a water’s surface. This behavior, she noted, was similar to surface-active compounds, or surfactants, such as the compounds in detergents that make soap bubbles. To test this idea, the researchers repeated the experiments, this time by swapping out bacteria for common synthetic surfactants, and found that they too produced longer-lasting bubbles that also thinned dramatically after a certain time period. This experiment confirmed that bacteria’s secretions act as surfactants extending the lifetime of contaminated bubbles. The researchers then looked for an explanation for the drastic change in a contaminated bubble’s rate of thinning. In clean bubbles, the thinning of the cap was mostly the result of drainage, as water in the cap mostly drains back into the fluid from which the bubble rose. Such bubbles live on the order of seconds, and their drainage speed continuously slows down as the bubble thins. But if a bubble lasts past a critical time, evaporation starts playing a more dominant role than drainage, essentially shaving off water molecules from the bubble’s cap. The researchers concluded that, if a bubble contains bacteria, the bacteria and their secretions, make a bubble last longer on a water’s surface — long enough that evaporation becomes more important than drainage in thining the bubble’s cap. As a bubble’s cap gets thinner, the droplets it will spray out when it inevitably bursts become smaller, faster, and more numerous. The team found that a single bacteria-laden bubble can create 10 times more droplets, which are 10 times smaller and ejected 10 times faster than what a clean bubble can produce. This amounts to hundreds of droplets that measure only a few dozens of microns and that are emitted at speeds of the order of 10 meters per second.